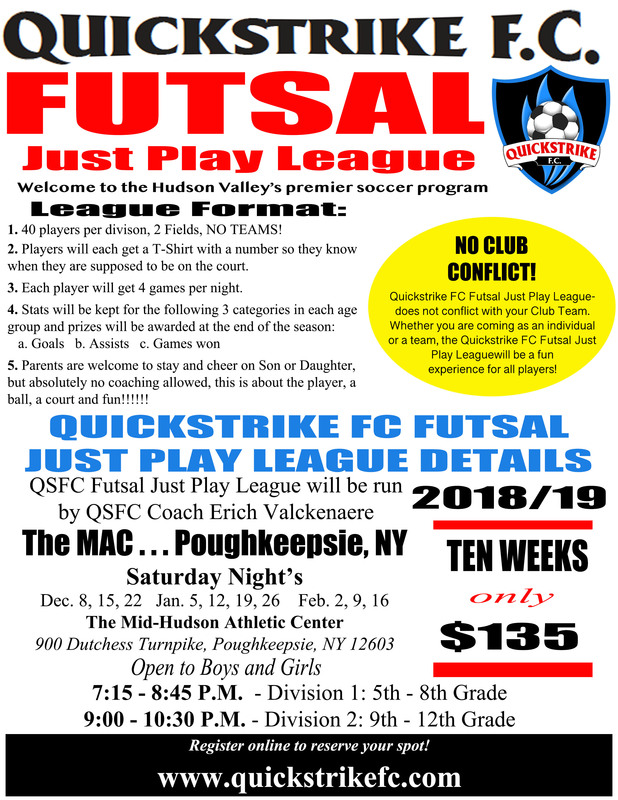 Quickstrike FC Futsal Teams will be trained and coached by our QSFC Staff. Futsal quickly develops skills required for soccer: balance, motor ability, agility and coordination, ball mastery, accurate and quick passing and receiving, perception insight and awareness. After playing in enclosed areas and learning to think and react quickly, players find when they play to the full game they react well under pressure. This also develops creativity; players are also develops creativity; players are also constantly placed in demanding decision making situations in enclosed areas. 20 Players per age group or per field (2 Fields), NO TEAMS! Players will get a T-Shirt with a number so they know when they are supposed to be on the court. Each player will get 4 games per night. Parents are welcome to stay and watch / support their son or daughter, but absolutely no coaching allowed! This is about the players, a ball, a court and LOVE OF THE GAME! 7:15 P.M. - 10:30 P.M.